Bring Her Home highlights the ongoing epidemic of missing and murdered indigenous women. It features original works by 16 visual artists from across the United States and many tribal nations. In light of the local movement to stop sexual exploitation and the international #MMIW awareness campaign, Bring Her Home shares visual stories of the impacted women. Emerging curator and artist, Angela Two Stars, brings together these artists to reclaim the identities of missing and murdered indigenous women. Rather than reduce the issue to a statistic, she challenges us to honor the life of each indigenous woman as we would a sister, a wife, a mother, a best friend, a cousin, or a daughter. Featuring new work from Shan Goshorn, Luzene Hill, Laura Youngbird, Kayeri Akweks, Hillary Kempenich, Chholing Taha, Cara Romero, and more. What does it mean to be missing? How are the families and loved ones affected and how do we create sanctuary, recovery, and healing? What are your thoughts on awareness and prevention of Missing, Murdered, and the Human Trafficking of Indigenous Women and Girls and what must be done to turn the tide on this epidemic social ill? The plea, “…we just want to bring her home…” addresses two potential outcomes: the enduring hope that the missing woman is found alive, and the grief and agony in the closure that comes from the murdered brought home. What are your thoughts on this complexity of emotions? Angela Two Stars (Sisseton Wahpeton Sioux) is a public artist, illustrator, and educator. She received her BFA from Kendall College of Art and Design in 2017. Activism plays a recurring role in Angela’s work. From language revitalization to social issues, Angela utilizes the power of art to create positive change and raise awareness to contemporary issues that are important to her. 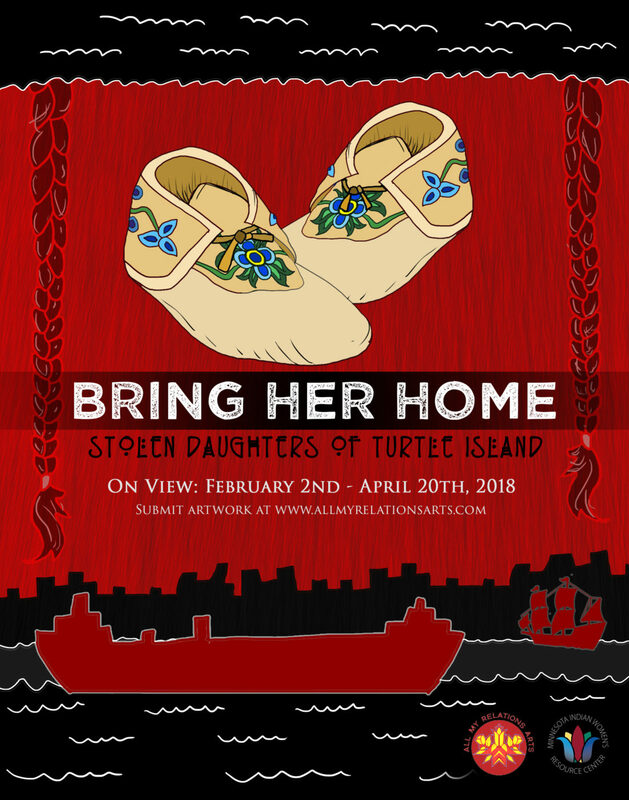 The exhibition, Bring Her Home: Stolen Daughters of Turtle Island looks at reclaiming the identity of the missing or murdered indigenous women, who over time are reduced to a statistic. Instead of this static fate, we choose to honor the life of the woman that was a sister, a wife, a mother, a best friend, a cousin, or a daughter. Advocating for change, this epidemic of missing and murdered Indigenous women affects us directly or indirectly, and we all have a shared responsibility to work towards solutions. Moira Villiard grew up on the Fond du Lac Reservation and is a visual artist, community organizer, and designer based in Duluth, Minnesota where she is also employed as the Arts & Cultural Program Coordinator at the American Indian Community Housing Organization (AICHO). On top of program administration, she works directly with victims of trafficking and domestic violence at the women’s shelter as an advocate and activities coordinator. All My Relations Arts (AMRA) operates the All My Relations Gallery, Minnesota’s premiere American Indian owned and operated contemporary fine arts gallery. Situated on Franklin Avenue in Minneapolis, the gallery resides within the heart of the American Indian Cultural Corridor. AMRA presents 4-6 fine art exhibits throughout the year, as well as hosting tours, presentations, and programs. The focus of AMRA is to provide the people of the Twin Cities, greater Minnesota, and beyond consistently high-quality exposure to Native American fine arts. As an initiative of the Native American Community Development Institute (NACDI), All My Relations Arts serves a very distinct role in NACDI’s community development work, providing the public with education about American Indian history, culture, and contemporary experiences through the arts. Minnesota Indian Women’s Resource Center (MIWRC) is supporting the exhibition in partnership with All My Relations Arts. The mission of the MIWRC is to empower American Indian women and families to exercise their cultural values and integrity and to achieve sustainable life ways while advocating for justice and equity.